This annual event brings together several hundred supporters from across the Capital region committed to providing justice for all detain immigrant men, women, and children in DC, Maryland, Virginia. A comprehensive training focused on the forms of legal relief available to detained adult immigrants and the role of pro bono attorneys in seeking relief. Includes substantive teaching sessions, workshops, and a mock court hearing. A training and litigation coordination session conducted by the Capital Area Immigrants' Rights (CAIR) Coalition's Immigration Impact Lab for the Federal Public Defenders of North Carolina. 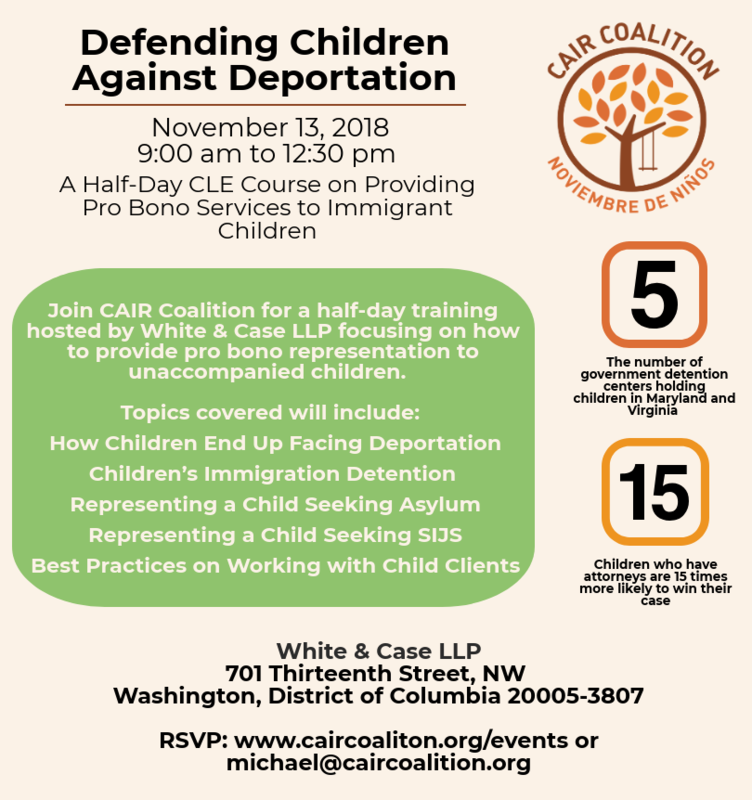 For questions please contact Adina Appelbaum, Senior Attorney, at adina@caircoalition.org or 202-899-1412 or David Laing, Senior Attorney, at david@caircoalitionorg or 202-769-5231. Join the Capital Area Immigrants' Rights (CAIR) Coalition's Immigration Impact Lab, Eliot Morgan Parsonage, and Cauley Forsythe Law Group for an in-depth training for Carolina criminal defense and immigration attorneys on the immigration consequences of criminal offenses, the ethical obligations that criminal defense attorneys owe to non-citizen clients, and cutting-edge immigration litigation. The Immigrant Outreach Committee, in conjunction with the Capital Area Immigrants’ Rights (CAIR) Coalition, present a timely CLE addressing ethical and legal considerations of immigration consequences of criminal dispositions in Virginia. This training for Virginia attorneys will serve as a comprehensive introduction to the complex intersection of federal immigration law and Virginia state criminal law. It will cover the heightened ethical duty that criminal defense attorneys owe to non-citizen clients under Padilla v. Kentucky and Zemene v.